Meet Sotrama, registered as an S.A.M. 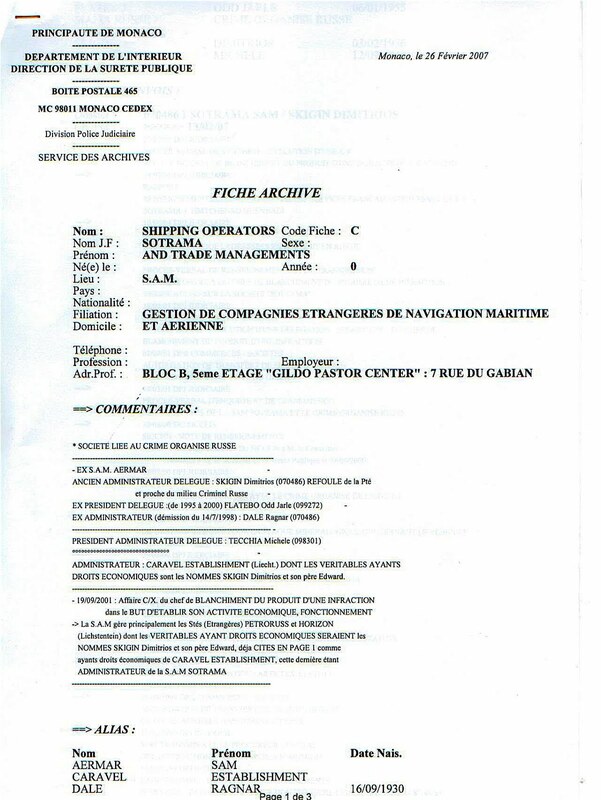 company in Monaco for "shipping operations and trade management." The file on Sotrama maintained by Monaco's police department (click the image) begins with these words: "Society bound to Russian Organized Crime." Obvious Question: If Monaco's police believe Sotrama to be "bound to Russian organized crime," why does Monaco's government continue to permit Sotrama to operate as a Monaco-registered S.A.M. company? Close associates of Russian Prime Minister Vladimir Putin are laundering money through Monaco and are suspected of acting on Putin's behalf. One such group of associates is Sotrama, which ties to the Tambov Russian organized crime group in St. Petersburg. Sotrama was founded by Dimitros Skigin, born 3 February 1956 in Leningrad. Skigin was expelled from Monaco in 2000 due to his shady associations. Oddly, Sotrama was not expelled along with its owner, and has conducted business in the principality ever since. Skigin moved to Saint-Jean Cap Ferrat and died of cancer in 2003. Skigin was replaced as chairman of Sotrama by Michele Tecchia, an Italian-born resident of Monaco. Monaco's police file on Michele Tecchia explicitly states that through Sotrama Tecchia launders monies derived from criminal activity. The importance of Monaco's financial market will require extreme vigilance to avoid the development of the type of financial activities which are not welcome in our country. To avoid such deviance, Monaco must function in harmony with all those organizations who share the same aim. Monaco must therefore respect the requirements of the Financial Action Task Force on Money Laundering. Prince Albert's words beg a second obvious question: If Monaco's interior ministry knows that Sotrama is connected to Russian organized crime and knows that Michele Tecchia uses Sotrama to launder criminal money, why does it turn a blind eye, thus rendering the Sovereign Prince of Monaco a big fat liar?